''The Fisherman, Kerala'' is a delicately painted art work that captures the atmosphere and elegance that Ann Shrager has experienced on her travels in India. 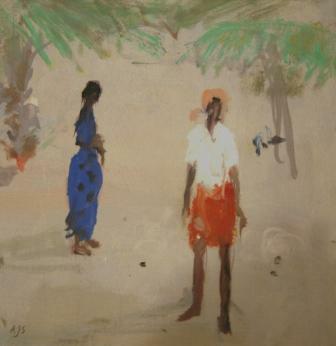 Subtle shadows in the sand contrast with the figures bright clothing and the distance between the man and woman suggests calm. Ann Shrager was elected a member of The New English Art Club in 1975. And, since then has participated in numerous modern art shows. In addition to Red Rag Modern Art Gallery Ann Shrager has exhibited at other leading British Art Galleries. Each painting at Red Rag is sourced from the Ann Shrager artist studio and like all Red Rag British art and Modern art it can be shipped worldwide. Click here to view more contemporary paintings by Ann SHRAGER.